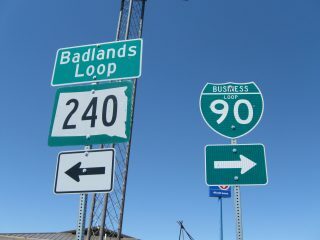 Business Loop I-90 and U.S. 14 travel together through Sundance, Wyoming. 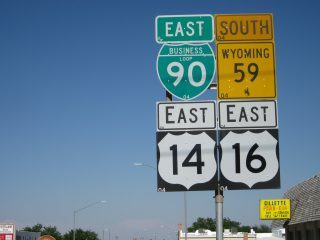 The two routes intersect Wyoming 585 at the center of town. This view looks westbound along Cleveland Street at Sixth Street. Photo taken 06/28/13. Transcontinental Interstate 90 has approximately 39 active off-Interstate business loops and spurs throughout the Northwest, Rocky Mountain and Great Plains states. There are no business routes posted east of Austin, Minnesota for the remainder of the 1,360 mile route of I-90 to Boston. 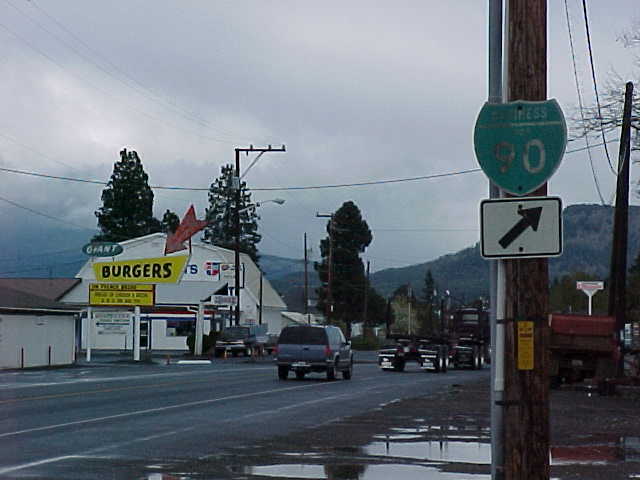 The former business loop through Cle Elum connected with I-90 from Exit 84 to Exit 85 via old U.S. 10 and Washington 903. 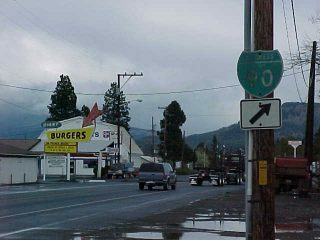 As of June 1999, there was at least one Business Loop I-90 shield still posted in Cle Elum. It could not be found in August 2006. This business route forms a 5.2 mile loop from I-90 between Exits 106 and 109 along portions of old U.S. 10 and U.S. 97. Business Loop I-90 briefly overlaps with U.S. 97 east from a parclo interchange next to the Yakima River to Dolarway Road. 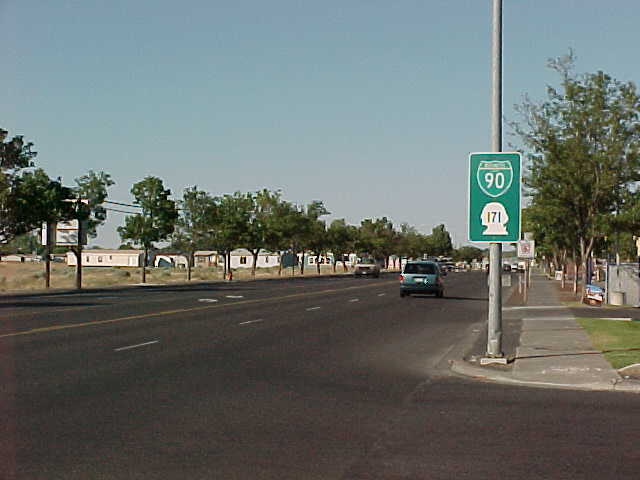 U.S. 97 branches north from there while the business route stays east along University Way to Main Street and the Ellensburg street grid. Main Street takes the route south through the city center to Canyon Road. Canyon Road (former U.S. 97) expands the route into a five-lane commercial arterial with an array of motorist services (gas, food, lodging) to I-90. This business loop was field-checked by Mark Bozanich in May 1999 to reveal signs throughout Ellensburg. Some of these remained as of June 2012. 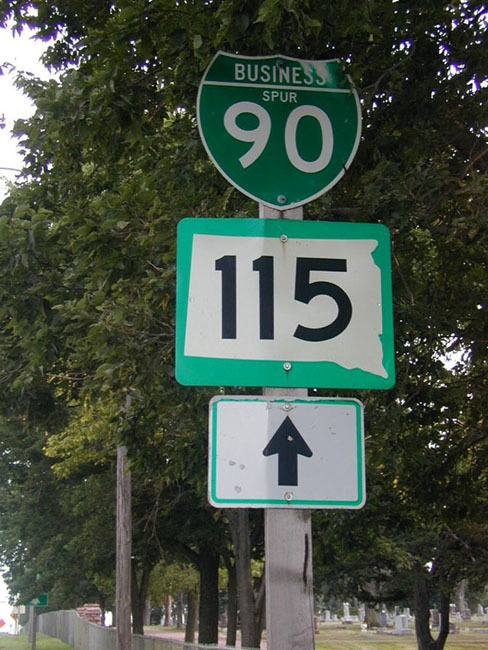 However, guide signs on the Interstate 90 main line omitted the route. Business Loop I-90 in Moses Lakes travels a horseshoe shaped route for 6.2 miles between Exits 176 and 179. The route lines portions of old U.S. 10 via Broadway Avenue and Pioneer Way to the Moses Lake city center. Washington 171 overlaps with Business Loop I-90 along Broadway Avenue on the western half of the route while Washington 17 accompanies the route southeast from Road K to Interstate 90. 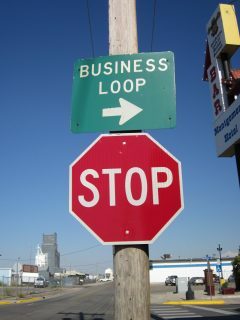 This business loop served Ritzville north from I-90 between Exits 220 and 226 via old US 10-395. The 6.8-mile route followed west 1st Avenue northeast to the city center, and Danekas Road northeast from there to Schoessler Road and a return to I-90. The Ritzville business loop was field-checked by Mark Bozanich in May 1999 and again in 2000. Signs remained within the Ritzville city limits at that time, but are none were posted by 2006.
Business Loop I-90 in Spokane followed a ten-mile course from Exit 276 to Exit 285 along portions of old U.S. 10. Portions of old U.S. 2, U.S. 195, and U.S. 395 ran concurrent with parts of old U.S. 10 in the Spokane area. 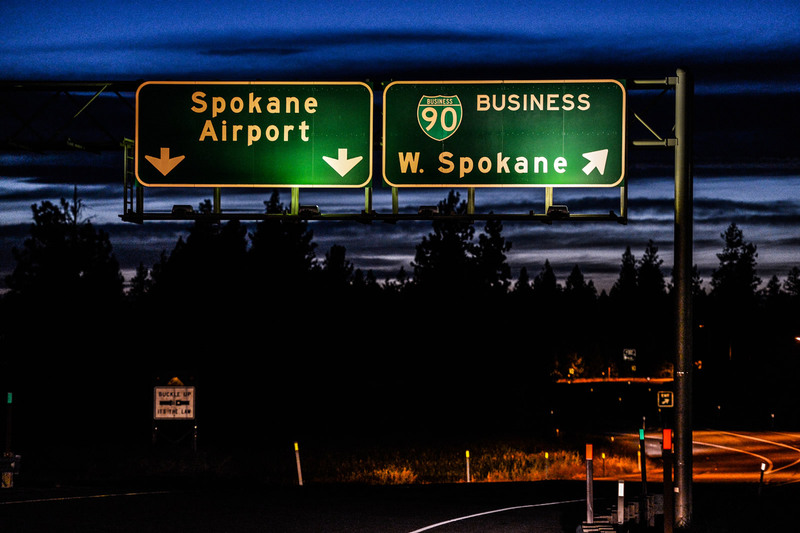 Entering Spokane from the west, Business Loop I-90 is posted from both I-90/U.S. 395 and U.S. 2. From the east, the traditional business route is posted at the Interstate 90 exit as the Sprague Avenue Business Route. Spokane County not only does not do a good job of posting Business Loop 90 signs along East Sprague Ave, it also avoids posting trailblazer signs to Interstate 90 from those north-south arterials that cross Sprague and [the] interchange with Interstate 90. 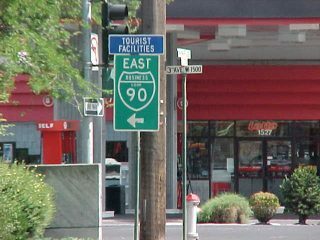 A visit to Spokane in 2006 revealed no signing for Business Loop I-90 along the mainline in the city center. The only signs remaining for this business loop are posted at the interchange between U.S. 2 and Sunset Highway, northeast of Spokane International Airport (GEG). AASHTO approved this non-state maintained business loop on May 5, 2013. Continuing along portions of historic U.S. 10 east from the former Spokane business route, the Spokane Valley Business Loop for I-90 extends east from Exit 285. Business Loop I-90 travels along the Valley Couplet of Appleway Boulevard east and Sprague Avenue west between I-90 and University Road. The Valley Couplet was completed in 2000. Construction converted East Sprague Avenue from two-way traffic into a four-lane westbound roadway, complementing the new four-lane eastbound Appleway Boulevard. East from University Road, Business Loop I-90 carries two-way traffic along East Sprague Avenue, the former alignment of U.S. 10, before returning to I-90 by way of Appleway Avenue east to Barker Road north. The route is approximately 8.21 miles long. 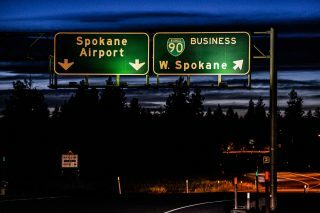 It ends at Exit 293.
Business Loop I-90 guide signs are posted on both I-90 east at Exit 285 and I-90 west at Exit 293 for the Spokane Valley business route as of 2015. 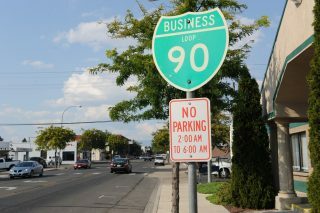 Signs are posted at the turns of Business Loop I-90 in Post Falls and at the ramp ends from Interstate 90 as of 2015. All signed references to the Business Loop were removed by August 2012. This included green outs over signs posted at Northwest Boulevard. The Kellogg Business Loop was dropped from the ITD Milepost log by 2006. 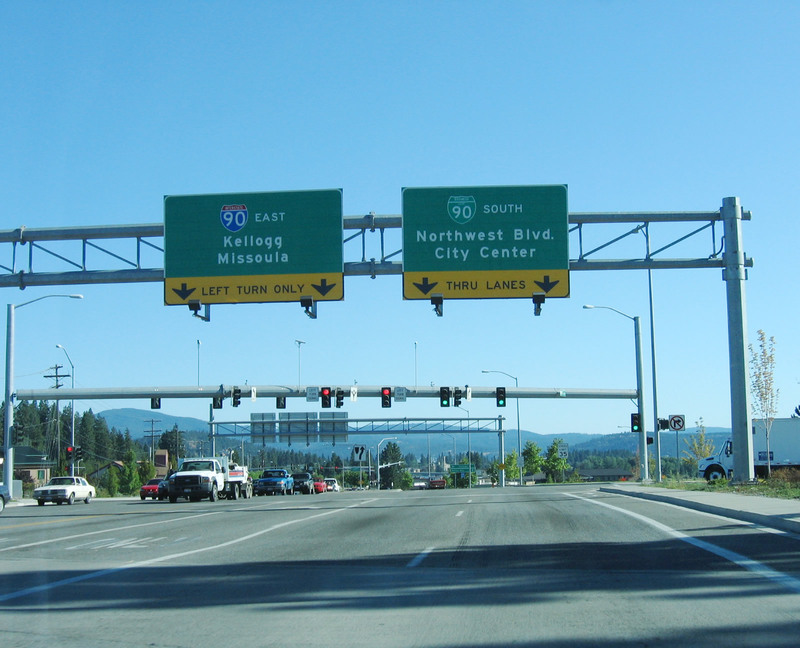 Shields were removed from guide signs on I-90 and replacement signs installed by 2012 omitted the space previously allocated for the business route. The route followed Cameron Avenue (old U.S. 10) from Exit 49 with Bunker Avenue southeast to Exit 51 at Division Street. As of 2012, shield assemblies remain at Hill Street and near Cedar Street. What was originally Business Loop I-90 connecting Osburn with Silverton was split into separate state-maintained Business Spurs by 2013. The Osburn Business Spur travels 1.52 miles from Exit 57 south along Third Street to Mullan Avenue (former U.S. 10). Business Spur I-90 follows Mullan Avenue east to Silver Valley Road, concluding at the Osburn city line.1 The loop used to continue beyond this point on Silver Valley Road into unincorporated Silverton. It may remain signed as a full loop despite the middle portion no longer being maintained by the state. Business Spur I-90 at Silverton represents the eastern extent of the former I-90 Business Loop leading back to Osburn. A 1.1 mile gap separates the two along Silver Valley Road (old U.S. 10) as it parallels the Coeur d’s Alene River South Fork. The Wallace business loop travels 1.243 miles through Wallace along portions of old U.S. 10. 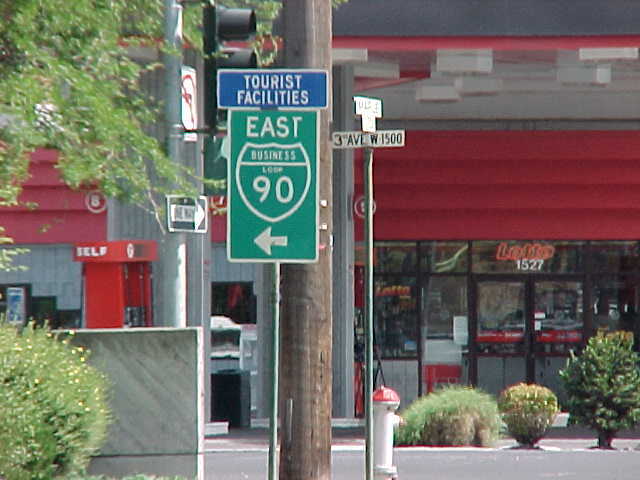 Beginning at Exit 61, Business Loop I-90 connects I-90 with Front Street (Harry F. Magnuson Way) via North Frontage Road. The route follows Front Street east along the South Fork of the Coeur d’Alene River to 5th Street and the Wallace street grid. 5th Street south to Bank Street east returns the route to I-90 at Exit 62. 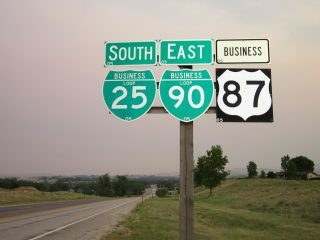 This business route follows Montana Secondary 507 (old U.S. 10) through Alberton between Exits 75 and 77 via Railroad Street and Adams Street. This business route begins at Exit 101 and turns south along side U.S. 93 (Reserve Street) to a folded diamond interchange with Broadway Street (old U.S. 10). 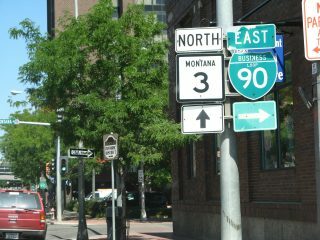 U.S. 93 remains south on Reserve Street to U.S. 12, while Business Loop I-90 turns southeast along Broadway Street to the Missoula city center and the University of Montana via U.S. 12 (Madison Street Bridge) west. A five block section of the route doubles as Business U.S. 12 between Higgins Avenue and Madison Street. U.S. 12 joins Business Loop I-90 east from there to Van Buren Street, where the two turn north to meet Interstate 90 at Exit 105. The route is well signed as of 2016, with an array of traveler services and lodging lining the Reserve Street leg. 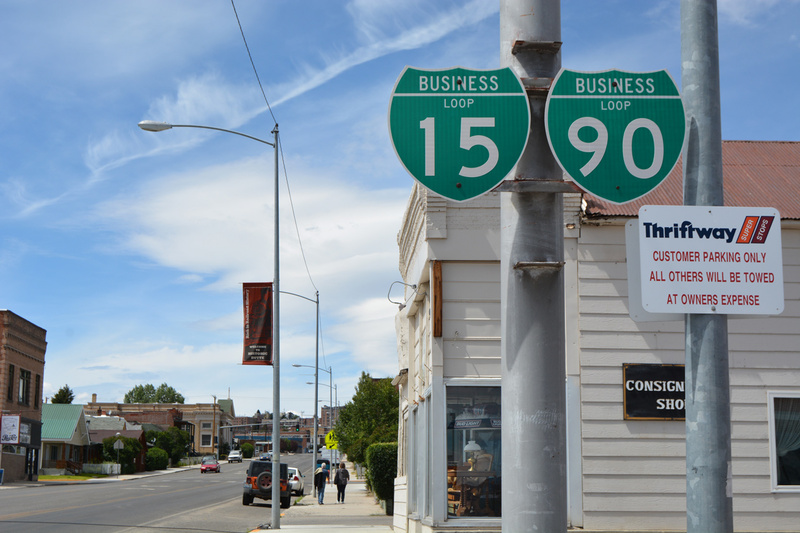 Business Loop I-90 serves Deer Lodge along a 3.5 mile route between Exits 184 and 187. The loop doubles as unsigned Montana Secondary 275 along Main Street, which is also old U.S. 10. Deer Lodge provides several lodging options for travelers and is a tourist destination with points of interest including the Old Prison Museums, Montana Auto Museum and Frontier Montana Museum. One final business loop on the day. 1996 date sticker on the back. Lone shield for the route. 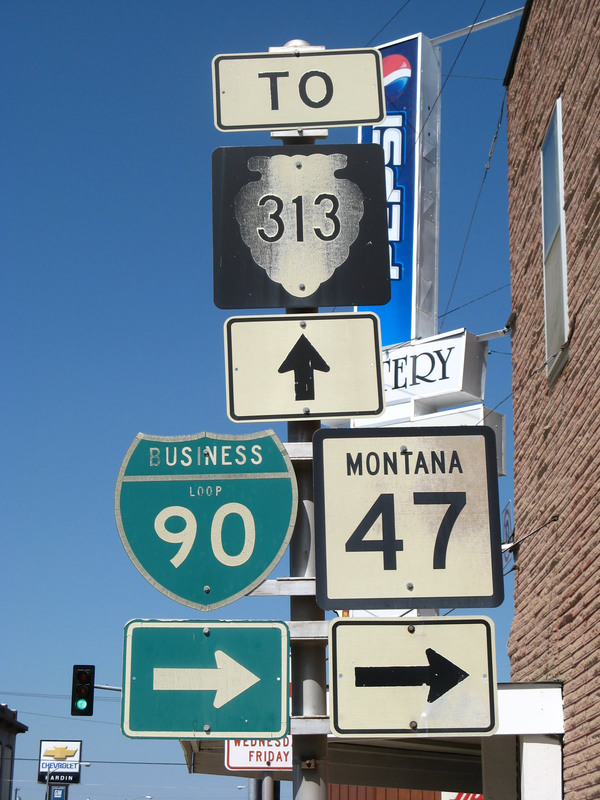 The Butte business loop follows the route of Interstate 115 and old U.S. 10-91 to Downtown Butte along a series of five streets. Cosigned with Business Loop I-15 for its entirely, the 5.5 mile route forms an Omega-shaped arc between Exits 124 and 127 of I-15 & 90. The route is fairly well posted as it extends east from I-115 along Iron Street to Montana Street north and Park Street east to the city center. Arizona Avenue turns the pair south to a seamless transition onto Utah Avenue South to a T-intersection with Front Street. Front Street curves the routes southeast below a Union Pacific Railroad bridge to Harrison Avenue, a four and five-lane commercial boulevard. Harrison Avenue returns the loops to Interstates 15 & 90 at a parclo interchange, opposite the north end of Montana 2 and Butte Plaza Mall. Good morning from Butte, Montana! 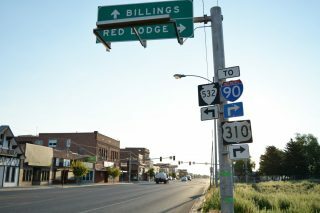 Forming a 3.3-mile L-shaped route, Business Loop I-90 joins I-90 with the Bozeman city center between Exits 306 and 309. Seventh Avenue leads the route south along a commercial arterial into the Bozeman street grid, where the loop turns east along side U.S. 191 on Main Street (old U.S. 10). Main Street bisects Downtown northeast of Montana State University to Lindley Park while U.S. 191 south provides a gateway to Yellowstone National Park. Eastern reaches of Main Street expand into a commercial arterial leading into the parclo interchange with Interstate 90 opposite old U.S. 10 and 191. A 2016 drive along the loop yielded sporadic signing of the business route. Interstate 90 & U.S. 191 bypass the city of Livingston to the south while Business Loop I-90 connects the freeway with the city center via a 6.7-mile route. The route begins at Exit 330 and quickly overtakes Highway 10 West, east into the city. Park Street (old U.S. 10 and 89) extends Business Loop I-90 through the business district to the Yellowstone River, where the route becomes rural ahead of the east end at Exit 337. 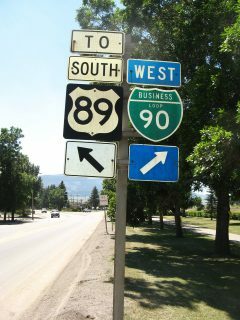 U.S. 89 ties into I-90 at Exit 333 from Yellowstone National Park to the south. The route north to Business Loop I-90 is unnumbered. Business Loop I-90 at Big Timber arcs 4.2 miles north from Exits 367 and 370 of Interstate 90. The western half of the route doubles as U.S. 191 along 1st Avenue (old U.S. 10), while the eastern section takes Big Timber Loop Road across the Boulder River back to I-90. One shield per direction was noted on a 2016 visit to the city. This business route follows Main Street (old U.S. 10) east through Laurel from an access road linking it with I-90 at Exit 433 to Exit 437 east of the city line. Totaling 5.0 miles, Business Loop I-90 once intersected the north end of U.S. 310 at 1st Avenue in Downtown Laurel. The US route was truncated to its interchange (Exit 434) with I-90 and U.S. 212 just to the south by 2008. Several shields were observed along Main Street for the business route in 2016. 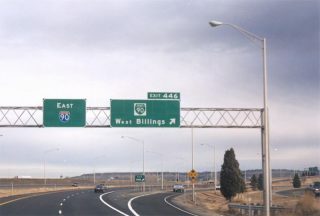 Comprising a multi-lane route for 7.0 miles, the Billings business loop angles northeast from an interchange complex (Exit 446) linking Interstate 90 with Mullowney Lane and Laurel Avenue. 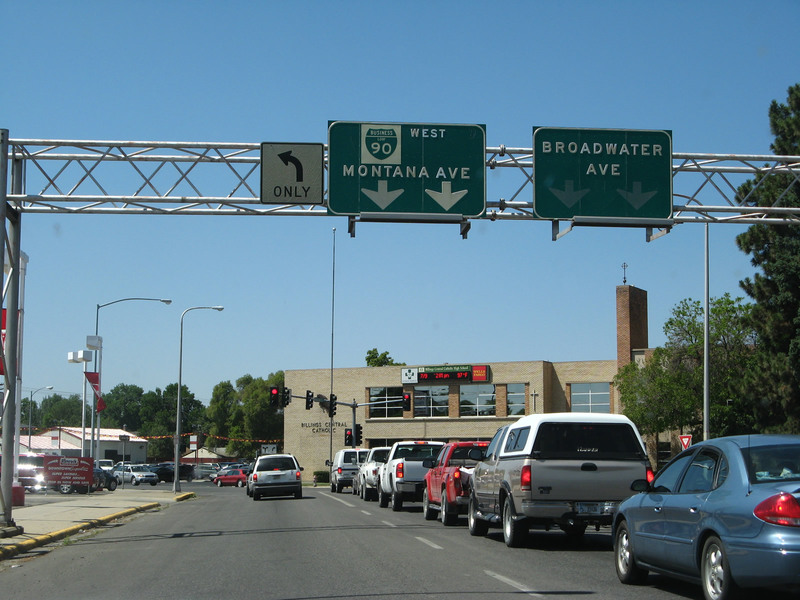 The route parallels Montana Rail Link (MRL) lines to a viaduct carrying traffic over the railroad and onto Montana Avenue. Business Loop I-90 runs along the north side of the MRL yard to Division Street, where it separates into a couplet using Montana Avenue east and 1st Avenue North west. 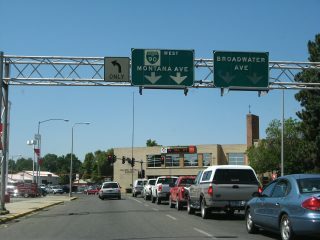 The one-way pair intersect Montana 3 (27th Street) at Downtown Billings. The state highway leads northwest to Montana State University Billings and Billings Logan International Airport (BIL). Remaining along old U.S. 10, the couplet of Business Loop I-90 recombines at North 18th Street along a five-lane section of 1st Avenue North. 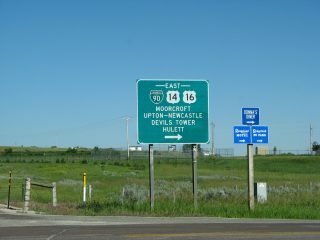 U.S. 87 ties into the route just west of the Yellowstone River, with the two highways spanning the river east to Interstate 90 at Exit 452. Traveler services cluster around the east and west ends of the route, while the central portion serves interests to Downtown. The business route remains well signed as of August 2016.
Business Loop I-90 forms a 2.9 mile arc south from I-90 through the city of Hardin. The route overlays portions of Montana 47 and old U.S. 87-212 along a combination of Crawford Avenue, 14th Street West, Center Avenue and Third Street East between Exits 495 and 497. The route is well marked in both directions. Sheridan represents the main service center along Interstate 90 between Billings and Buffalo, in addition to a tourism hub for visitors to the Big Horn Mountains. A 4.8 mile long business loop serves the city between Exits 20 and 25. Business Loop I-90 branches south from a trumpet interchange with I-90 along Main Street to the city center. The route returns to I-90 via Coffeen Avenue southeast and Brundage Lane via U.S. 14. Following standard Wyoming practice, the business route is also signed as Business U.S. 14-87. The 3.9 mile business loop for I-90 in Buffalo forms an L-shaped route between Exits 56A and 58. The route is cosigned with Business Loop I-25 & U.S. 87 Business along north-south Main Street and with U.S. 16 along east-west Hart Street. Business Loop I-25 & U.S. 87 Business follow Main Street south through the city center to I-25 while U.S. 16 branches west from the pair to Worland. All motorist services are available along the Hart Street segment between Main Street and the diamond interchange (Exit 299) with Interstate 25.Both routes are well signed, with business route signs posted en route to the city center and trailblazers for I-25 and/or I-90 leading away from the business district. Saw BL I-15 & 84 last month and here's another Interstate Business Loop tandem. Interstate 90 arcs across Gillette while a business loop connects the freeway with Downtown along Second Street. 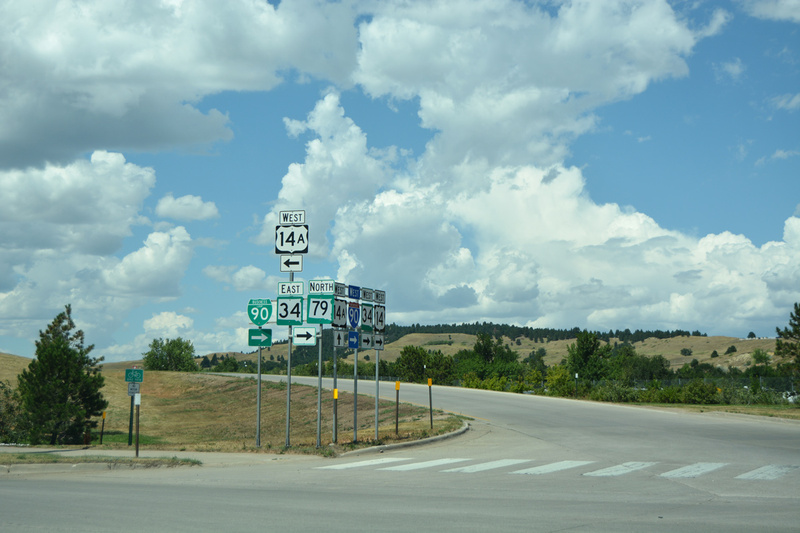 The 3.9-mile route runs between Exit 124 at Skyline Drive (Wyoming 50) and Exit 128. With the exception of a very short segment at the western end along WY 50, this business route is also signed in part as U.S. 14, U.S. 16 and Wyoming 59. With the development of Gillette into one of the largest cities in northern Wyoming, several motorist services are found along Wyoming 59 (Douglas Highway) via Interstate 90 at Exit 126 rather than along the business loop. Guide signs along I-90 eastbound at Exit 128 omits all signed routes and instead displays “Port of Entry”. Traveling 1.9 miles, Business Loop I-90 follows U.S. 14 and 16 through Moorcroft via Converse Street. Per a visit in July 2008, the loop is not signed from either direction on the freeway mainline, but shields are present along the loop itself. This remains the case of August 2016. This kind of error happens in Wyoming from time to time. Business 90 is shown as I-90 on this recently replaced shield…. Cosigned with U.S. 14 for its entire length, the Sundance business route intertwines with I-90 between Exits 185 and 191 via West and Cleveland Streets. The east end of the loop utilizes an access road between Old U.S. 14 and the Sundance Port of Entry. 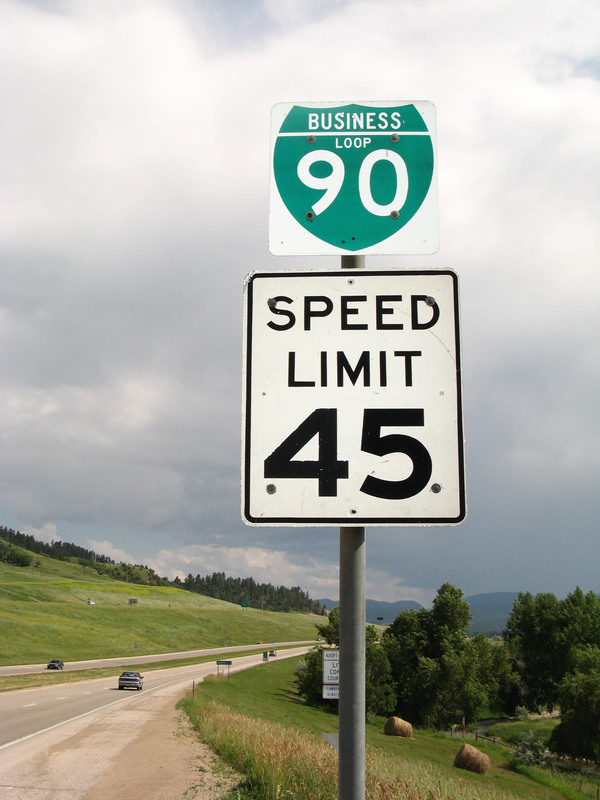 The Spearfish business loop for I-90 begins at Exit 10 opposite U.S. 85 north to Belle Fourche. The 5.2 mile route follows North Avenue through North Spearfish and Main Street along the old alignment of U.S. 14 and 85 to the Spearfish city center. Turning east along Colorado Boulevard, U.S. 14A accompanies the business loop as it reconnects with the freeway at Exit 14. The route is referenced from the I-90 mainline and somewhat signed across the city. A $28 million project redesigns the diamond interchange at the east end into a single point urban interchange. The project runs through June 1, 2018.
Business Loop I-90 serves Sturgis, and its annual bike rally, along a 3.3-mile route between Exits 30 and 32. The east-west portion doubles as South Dakota 34 & 79 (and old U.S. 14) to the city center, while the north-south component is locally maintained. 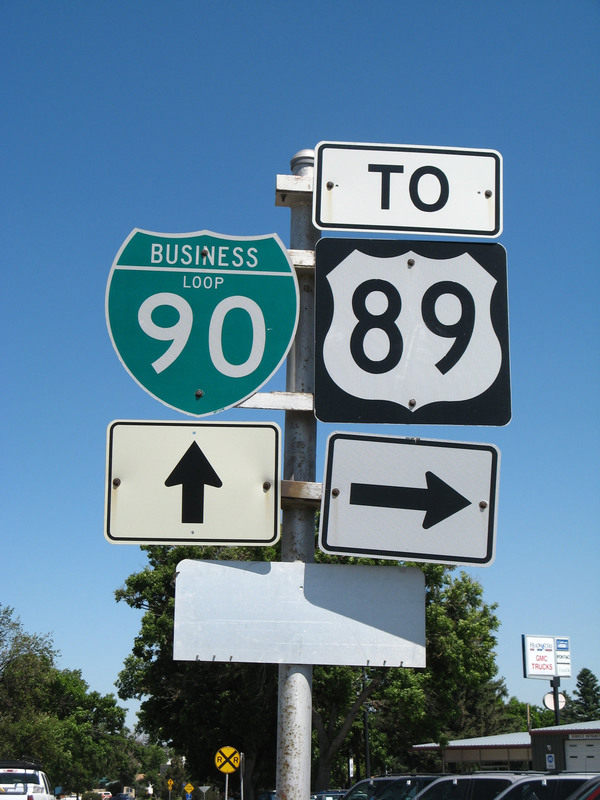 Per a 2016 drive through the city, Business Loop I-90 is marked in both directions. The longest Business Route for I-90, the Rapid City area route loops south from Exit 52 at Blackhawk to Exit 60 by Rushmore Crossing shopping center. 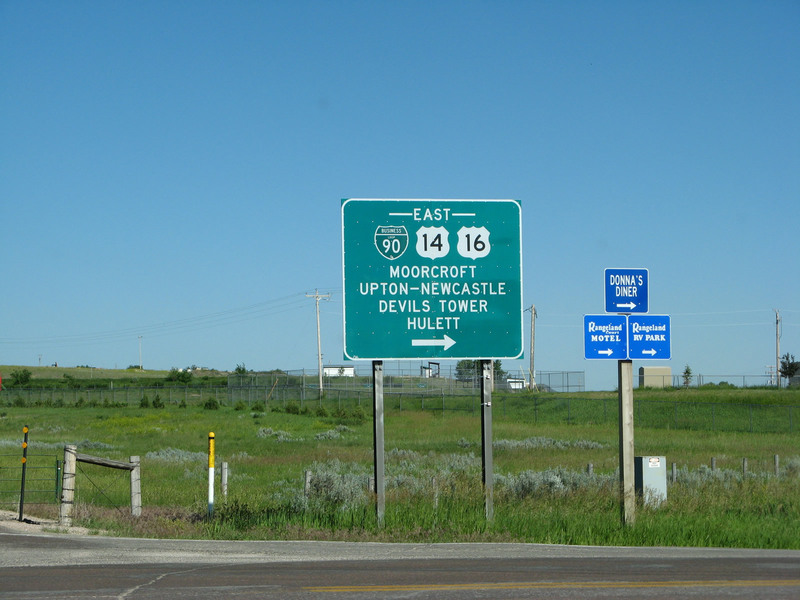 Traveling 11.8 miles overall, Business Loop I-90 begins at the diamond interchange with Peaceful Pines Road, which it takes west to Sturgis Road (old U.S. 14 & SD 79). This configuration replaced a direct off-ramp to Sturgis Road when I-90 was realigned at Blackhawk by 2009. 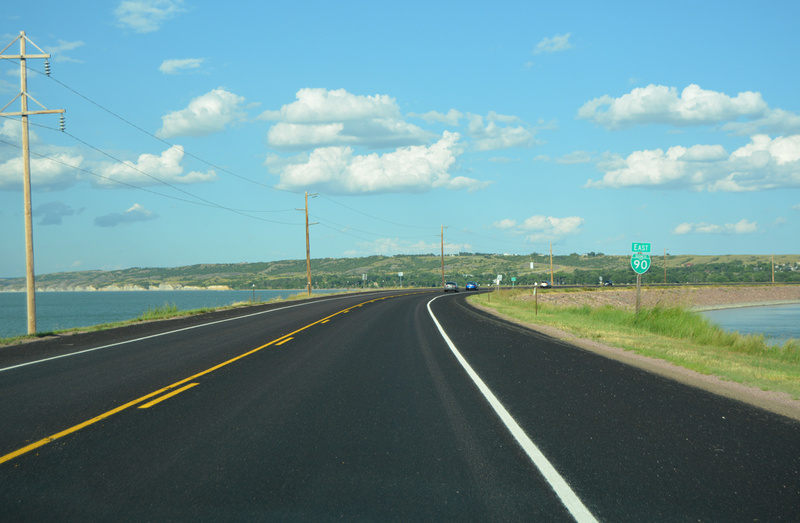 The Sturgis Road alignment south to Chicago Street in west Rapid City is state maintained and designated SD 231. The route is unmarked otherwise as it forms part of a truck route with SD 445 to SD 44 on Omaha Street. Business Loop I-90 parallels these routes to the south along locally maintained Main Street to SD 44 and Baken Park Shopping Center. The commercial arterial advances east to split into a couplet using St. Joseph Street (east) and Main Street (west) through Downtown Rapid City. The one-way pair of Business Loop I-90 combines along East Boulevard as the route turns north to intersect SD 44 (Omaha Street) again and cross Rapid Creek. Arcing east, North Street comprises a four to five lane commercial boulevard carrying the business route back toward I-90. The loop concludes at a single point urban interchange in a growing retail area. 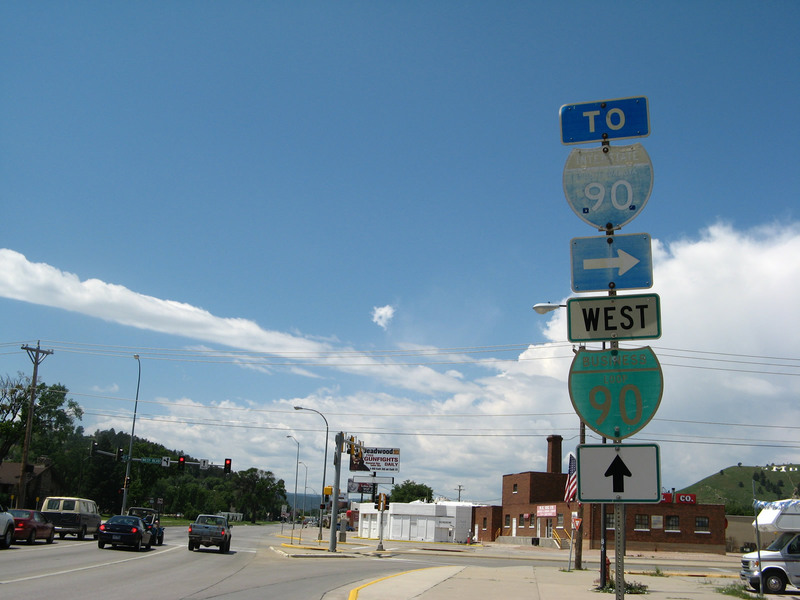 Possibly relating to the fact that the majority of the route is no longer state-maintained, many commercial mapping companies dropped Business Loop I-90 references from their Rapid City insets in the late 1990s. The loop however remained signed in the field as verified in September 2004, August 2014 and August 2016.
Business Loop I-90 at Wall travels 1.8 miles between diamond interchanges at Exits 109 and 110 within the town. The route bypasses the city center and the regionally famous Wall Drug Store in favor of a surface route bypass along South Boulevard, from Airport Road (old U.S. 14 & 16) to Glenn Street. Glenn Street returns the route to I-90 & U.S. 14, opposite the beginning of South Dakota 240, the Badlands Loop to Badlands National Park. Business Loop I-90 in Kadoka begins at Exit 150 and follows SD 73 south to SD 248 (Highway 16) east through the city business district. The 2.9 mile route concludes via South Creek Road north to Interstate 90 at Exit 152. SD Hwy 248 is not shielded and instead signed as the formal street name. The 1.1 mile business spur departed Interstate 90 at Exit 163 and followed SD 63 (Main Street) south into the rural town of Belvidere. The business spur signs were removed as of 2009. A lone service station was in operation on Main Street at I-90 in August 2016. It appeared the remaining businesses in the community of 63, including a post office, were shuttered. This business loop serves the city of Murdo along a 2.3 mile route from Exit 191 with SD Hwy 248 to Exit 192 with U.S. 83. The route follows Fifth Street (old U.S. 16) east to Kennedy Avenue south, with most services located toward or at the east end. Where Business Loop I-90 east ends, U.S. 83 north merges onto I-90 from Valentine for a 20-mile overlap toward Vivian. Murdo #SouthDakota Business Loop I-90. This 3.6 mile long business loop served Vivian between Exits 212 and 214 via U.S. 83 north, SD Hwy 248 (Old U.S. 16) east, and 293rd Avenue south. No signs for the business loop were posted in 2009, and as of 2016, just one service station was located along the former route. The Business Loop for I-90 at Presho follows a portion of SD Hwy 248 (old U.S. 16) east from 305th Avenue to Willow Street. Only 2.0 miles in length, the business route connects with I-90 via rural diamond interchanges at Exits 225 and 226. The Presho Business Loop for I-90 ties into the north end of US 183. US 183 runs south 1,250 miles to Refugio, TX. 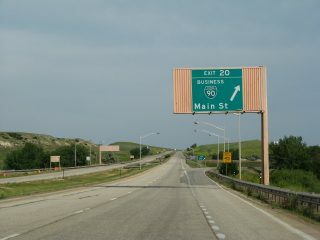 This 7.4 mile route of Business Loop I-90 begins at Exit 260 and Dougan Avenue at the town of Oacoma. Overtaking Highway 16 parallel to the freeway, the business route passes by a number of services including Al’s Oasis en route to the American Legion Memorial (Chamberlain-Oacoma) Bridge across Lake Francis Case of the Missouri River. East into Brule County, Business Loop I-90 enters the Chamberlain city center with it combines with South Dakota 50 along King Street. The pair curve southward and expand into a four-lane boulevard to Sorensen Drive. The route ends south of there as SD 50 east commences a 6.7 mile overlap with Interstate 90 east from Exit 265. The Chamberlain-Oacoma Bridge opened to traffic on September 25, 1925. Due to the construction of the Fort Randall Dam, the span was relocated and expanded in 1953 to accommodate the creation of Lake Francis Case. Dedicated on December 7, 1953, the bridge has five through truss spans in each direction, connected to the west banks of the Missouri by a long causeway. The crossing was added to National Register of Historic Places in 1995 and refurbished in 2011-12. Designated as Business Spur I-90P but not signed in the field, the 0.513 mile route followed 374th Avenue north from Exit 296 to Old Highway 16 at Main Street in the rural city of White Lake. The route is no longer listed in the South Dakota Codified Laws for the State Trunk Highway System. The former business route for I-90 at the city of Plankinton looped north from Exits 308 and 310. The western 2.552 miles of the route, consisting of Main Street north and Davenport Street (historic U.S. 16) east double as SD 258. SD 258 is an unsigned municipal and state secondary highway. The eastern leg of the route follows U.S. 281 between Old Highway 16 and Interstate 90 for 1.3 miles. Signs for the Plankinton business loop were removed by 2009 and South Dakota 258 remains unposted as of 2016. The state maintained business route for I-90 through Mitchell begins at Exit 330 and ends at Exit 332. The loop initially runs along side South Dakota 37 (Ohlman Street) north to Havens Street (old U.S. 16). Havens Street crosses the Mitchell street grid east as a five lane boulevard to Sanburn Boulevard, south of the city center. 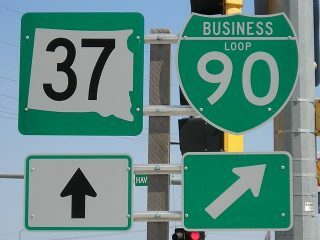 The 1.426 mile segment on Havens Street leads Business Loop I-90 east to South Dakota 37 and 38 at Burr Street. Burr Street takes the loop southeast along side SD 37 to a commercialized diamond interchange with I-90 while SD 38 lines the next 12 mile segment of old U.S. 16 east toward Alexandria. The famous Corn Palace, a converted municipal gymnasium located at the intersection of Main Street and Fifth Avenue, is located a mile north of the business loop in Downtown Mitchell. The Business Loop is well signed, with a trailblazer posted at Havens and Sanborn Boulevard as well. Uniquely signed as “Downtown Spur” I-90, the Sioux Falls business spur extends south from Exit 399 to the city center along a 5.1 mile course. Cosigned with South Dakota 115, the route utilizes portions of old U.S. 77 along a route using Cliff Avenue, Benson Road and Minnesota Avenue. Business Spur I-90 south ends at the one-way couplet of 10th Street and 11th Streets in Downtown Sioux Falls, where Business Spur I-29 ends from the west and Business Loop I-229 makes a 90 degree turn from Minnesota Avenue (SD 115) onto the couplet of 10th & 11th Streets. The northbound direction of the business spur is generally signed with trailblazers for Interstate 90 in lieu of business route markers. According to Brad Schwartze, in 2006 SD 42 and SD 115, along with the cosigned Business Loops/Spurs for I-29, I-90 and I-229, within the city of Sioux Falls were turned over to the municipality for maintenance. South Dakota DOT’s Transportation Inventory Management group indicated that these actions occurred so that the city could overtake traffic management along the respective routes. The state and business spur designations remained signed, although with less attention under city maintenance. Remaining Downtown Spur I-90 shield on Cliff Avenue. The old alignment of U.S. 77 through Sioux Falls took Minnesota Avenue (SD 115) to North Drive, which it followed northeast to Cliff Avenue. This changed when the eastern most section of North Drive permanently closed, severing the connection with Cliff Avenue. Traveling 3.2 miles, this business loop begins at Exit 42 and ends at Exit 45. Diagonal Road (CR 25 / former MN 266) takes the route southeast to Oxford Street. Oxford Street, the historic alignment of U.S. 16, extends east to the Worthington city center, where it combines with U.S. 59 from Humiston Avenue to a roundabout with Minnesota 60. MN 60 (Oxford Street) returns the route to I-90 by a pair of truck stops and an industrial plant. Forming a U-shaped route south from Interstate 90 for 6.1 miles, this business loop begins at Exit 99 and ends at Exit 102. Bixby Road and 190th Avenue lead the route south along side CR 39 to the Martin County Fairgrounds and Lake Avenue (CR 26). Lake Avenue, the former alignment of U.S. 16, continues the business route east to the city center and one block section on Main Street. Blue Earth Avenue crosses the Fairmont street grid east to Minnesota 15 (State Street). A commercial arterial, MN 15 leads due Business Loop I-90 due north to a folded diamond interchange with Interstate 90. Small guide signs direct Business Loop I-90 between Downtown Fairmont and Minnesota 15.
Business Loop I-90 through the city of Austin follows a 4.2 mile route to the south of Interstate 90 along old U.S. 16. Beginning at Exit 175 on the west side of Austin, the route combines with Minnesota 105 along Oakland Avenue from Mower County 46 east to 12th Street NW/SW. There the route separates into a couplet (former Minnesota 116) to Downtown as MN 105 turns south. 1st Avenue SW carries eastbound traffic while Oakland Avenue flows west from 4th Street NE/SE. Two way traffic resumes along Oakland Avenue east across the Cedar River, where it changes names to Oakland Place. Oakland Place runs along side East Side Lake to a wye interchange (Exit 180A) with I-90. 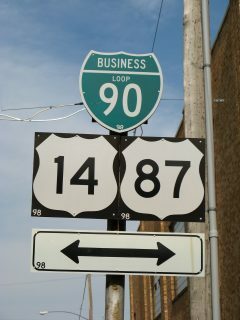 MN 105 and I-90 Business Loop in Austin. Idaho Transportation Department, Milepoint Log – State Highway System. “City to discuss taking over maintenance of Coeur d’ Alene Lake Drive.” Coeur d’Alene Press, October 1, 2012. “Drive delay: Coeur d’Alene City Council in no hurry over ITD road offer.” Coeur d’Alene Press, May 21, 2013. “Business loop to be named for man who helped reroute I-90.” Shoshone News Press April 1, 2010. 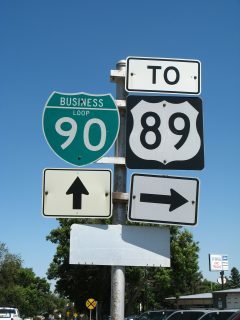 Removed by 2006, this trailblazer posted along Business Loop I-90 (old U.S. 10) preceded the shift of the business loop (SR 903) southeast from 1st Street in Cle Elum, Washington. Photo taken by Mark Bozanich (06/99). 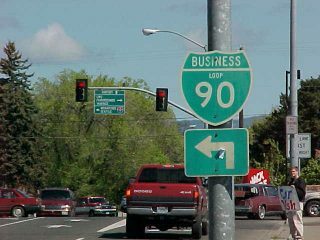 Reassurance marker for Business Loop I-90 west at the Ellensburg city center on Main Street north between 1st and 2nd Avenues. Photo taken by Jeff Royston (08/29/09). Business Loop I-90 turns west from Main Street onto University Way in the Ellensburg, Washington city center. This older design shield was still posted as of 2012. Photo taken by Mark Bozanich (05/99). 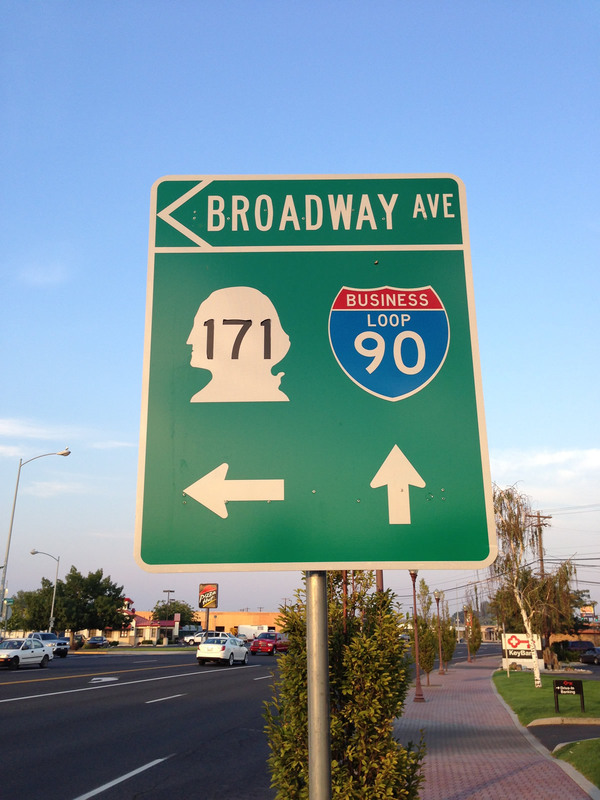 Reassurance sign for Business Loop I-90 & SR 171 north posted at Broadway and Driggs Drive in Moses Lake, Washington. Stand alone shields replaced this assembly by 2012. Photo taken by Mark Bozanich (05/99). Business Loop I-90 overlaps with Washington 171 north from I-90 to the Moses Lake city center. SR 171 and Broadway Avenue branch north from the loop to SR 17 north for interests to Ephrata and Soap Lake. Business Loop I-90 meanwhile transitions onto Pioneer Way back to the south. Note the erroneous tri-color shield for BL I-90. Photo taken by Jeff Royston (07/15/13). U.S. 2 separates from I-90 west along a short freeway spur northeast of Spokane International Airport (GEG) to Sunset Highway and Airport Drive. Sunset Highway (old U.S. 2) merged with Business Loop I-90 (Sunset Boulevard) leading east into West Spokane. Photo taken by Jeff Royston (07/15/13). Guide signs on U.S. 2 west are the only remaining signs referencing the Spokane Business Loop for I-90. Maple Street south between the former Business Loop I-90 couplet of West 2nd and 3rd Avenues in Spokane, Washington. This sign was removed by 2006. Photo taken by Mark Bozanich (08/00). The overhead pictured here was adjusted by 2012 to remove the business loop shield. Photo taken 09/02/06. Trailblazers posted along Highway 10 West ahead of Park Street, where Business Loop I-90 overtakes old U.S. 10 &amp; 89 to the Livingston, Montana city center. U.S. 89 bypasses the city via I-90 and U.S. 191 to the south but otherwise connects Livingston with Yellowstone National Park. Photo taken 07/09/08. 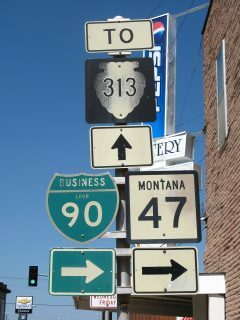 Older shield styles previously posted along Park Street west at the Business Loop I-90 (old U.S. 10) westbound split with old U.S. 89 in Livingston, Montana. This assembly was replaced by 2016. Photo taken 07/09/08. Business Loop I-90 (Main Street) east at Montana Secondary 532 and 1st Avenue in Downtown Laurel. U.S. 310 formerly began here, but now starts 0.4 miles to the south at Interstate 90 and U.S. 212. As of 2016, two shields still allude to the original terminus. Photo taken 08/08/16. Northbound Montana 3 (27th Street) at Business Loop I-90 (Montana Avenue) east in Billings, Montana. Business Loop I-90 follows Old U.S. 10 along a one-way couplet of Montana Avenue east and First Avenue North west through Downtown. The weather worn shield for Business Loop I-90 here was replaced by 2011. Photo taken 07/09/08. 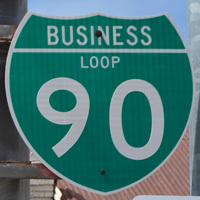 Business Loop I-90 splits from Interstate 90 & U.S. 212 east to overtake old U.S. 10 along Laurel Road through west Billings. The pull through panel was replaced with a truck route sign for Exit 452, but the sign for Exit 446 remains as of 2015. Photo taken by Andy Bagley (01/00). Older overheads with demountable copy remained in service at the Business Loop I-90 westbound turn from 1st Avenue North to Division Street south in Billings. These signs were replaced by 2013. Photo taken 07/09/08. Older shields posted at the turn of Business Loop I-90 from 3rd Street East (old U.S. 87) to Center Avenue in Downtown Hardin. This assembly was replaced by 2009, coinciding with the demolition of the adjacent business. Photo taken 07/09/08. 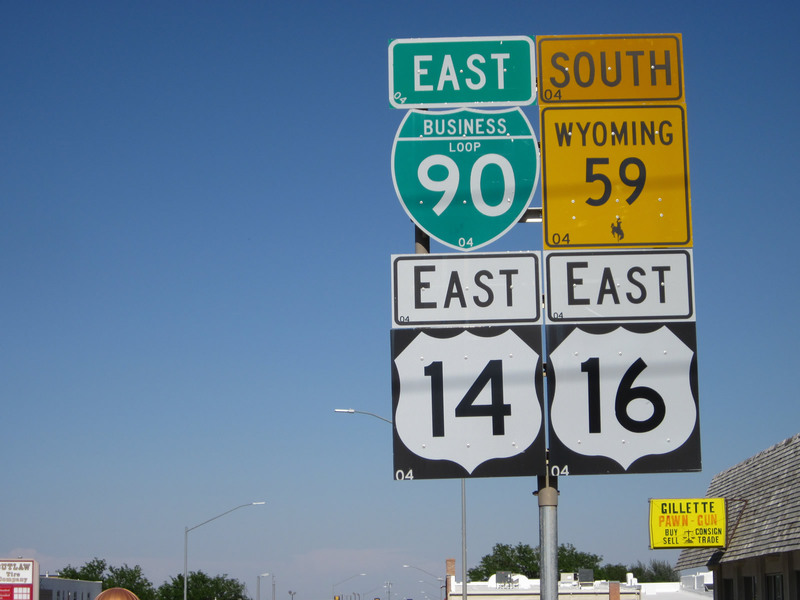 Along the northern tier of Wyoming, Interstate 90 intersects five business loops, one each for Sheridan, Buffalo, Gillette, Moorcroft and Sundance. Each of these routes overlap with U.S. highways. 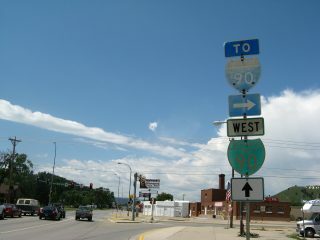 Here, shortly after entering the Equality State along with U.S. 87, eastbound Interstate 90 reaches Exit 20 for Business Loop I-90 & Business U.S. 14-87 (Main Street) into Sheridan. Photo taken 07/04/08. Wyoming 330 (West 5th Street) intersects Business Loop I-90 & U.S. 14-87 Business (Main Street) north of the Sheridan business district. 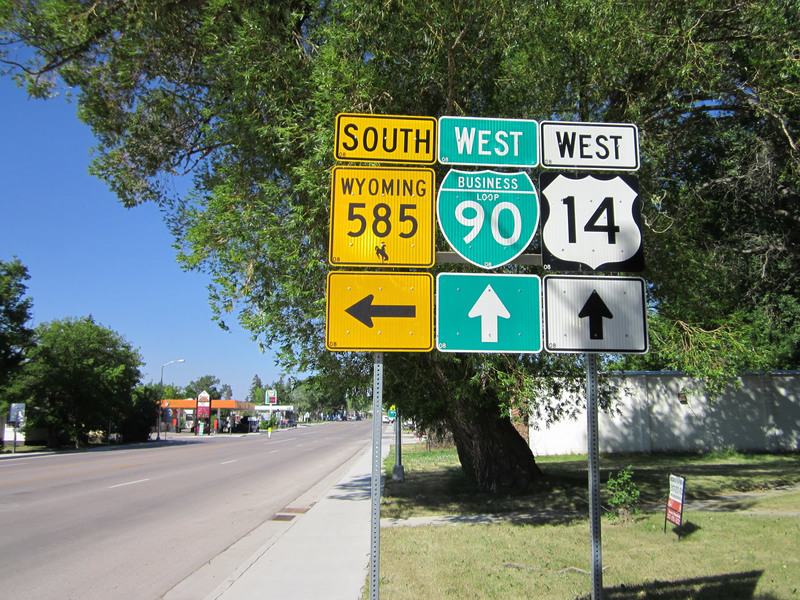 WYDOT signs most routes very well, including off-Interstate business loops and U.S. business routes. Photo taken 07/04/08. A rare occurrence of when two Interstate business routes overlap on the same stretch of roadway, Business Loop I-25 & 90 travel southward to the city of Buffalo, Wyoming. 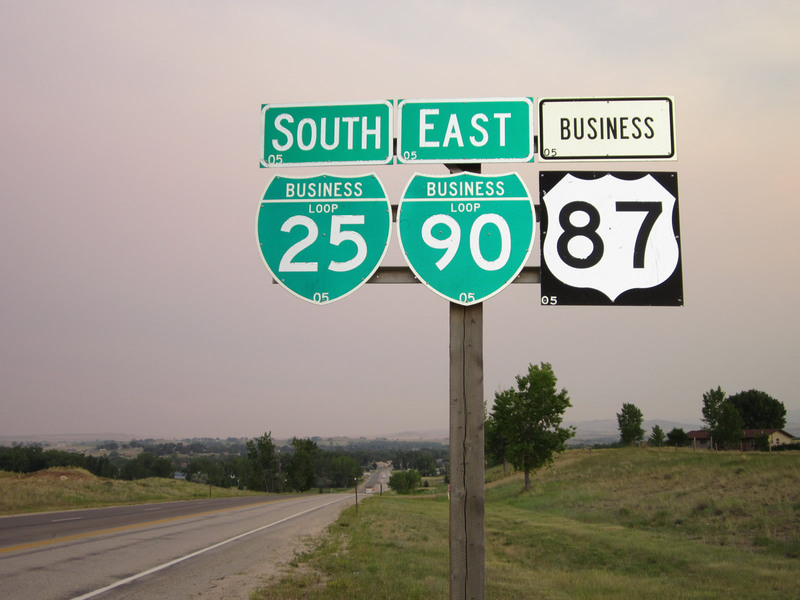 U.S. 87 Business runs in tandem with BL I-25 to the south end at Exit 298. Photo taken 06/28/12. Within Downtown Gillette, Business Loop I-90 shares pavement with U.S. 14-16 & Wyoming 59 along Second Street. The four routes are well-signed through the city center, including this shield assembly posted along eastbound Second Street near Gillette Avenue. Photo taken 06/30/12. This sign directs motorists on 1st Street east to Gillette Avenue for the Gillette Business Loop. Gillette Avenue bisects the city center south from Business Loop I-90 (2nd Street). Photo taken 06/30/12. Guide sign posted at the ramp end of Exit 153 for Business Loop I-90 & U.S. 14-16 east into the Crook County, Wyoming town of Moorcroft. A replacement made here by 2016 incorrect displays the business loop with a tri-color I-90 shield. Photo taken 06/30/08. 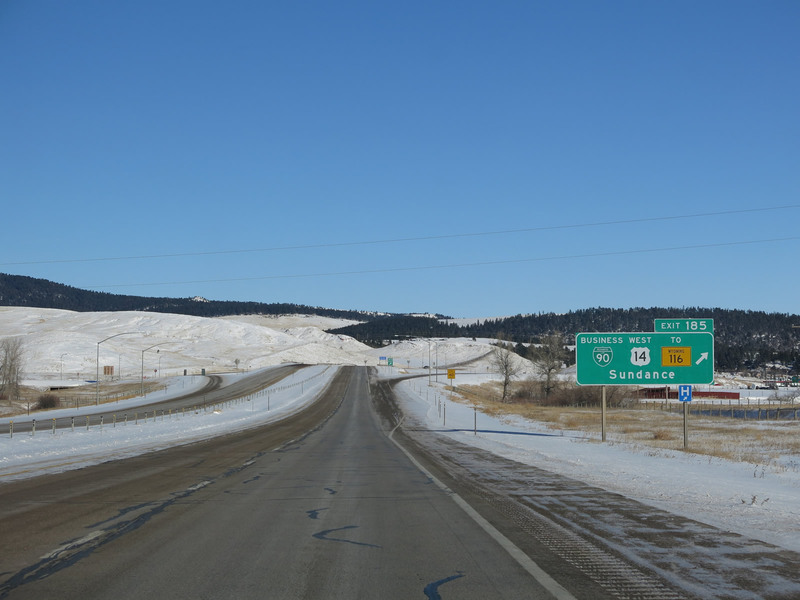 Interstate 90 east approaches Exit 185 for Business Loop I-90 & U.S. 14 east to Sundance, U.S. 14 west to Devils Tower and Hulett and Wyoming 116 south to Upton. The business route serves the Crook County seat along a 3.9 mile course. Photo taken 12/28/12. 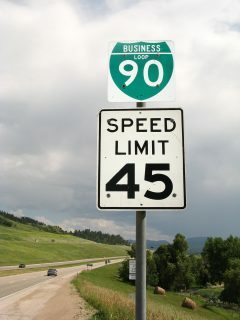 The first confirming marker for Business Loop I-90 as the route led away from Interstate 90 & U.S. 14 and 85 through North Spearfish, South Dakota. This assembly was replaced by 2012 with a stand lone shield for just the business route. Photo taken 07/07/08. 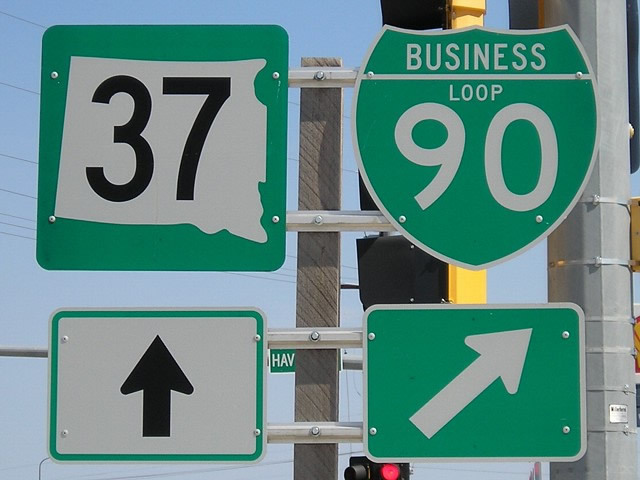 Business Loop I-90 is fully posted at each end point in Sturgis, South Dakota. This assembly stands at the westbound off-ramp to Lazelle Street. Photo taken 08/12/16. Trailblazers for Business Loop I-90 west and Interstate 90 formerly posted along Main Street at West Boulevard in Rapid City, South Dakota. West Boulevard leads directly to Interstate 190 north while Main Street transitions to two-way traffic beyond nearby Halley Park. This shield assembly was replaced by 2011. Photo taken 07/06/08. South Dakota 240 concludes a 40.03 mile route at the east end of Business Loop I-90 in Wall. 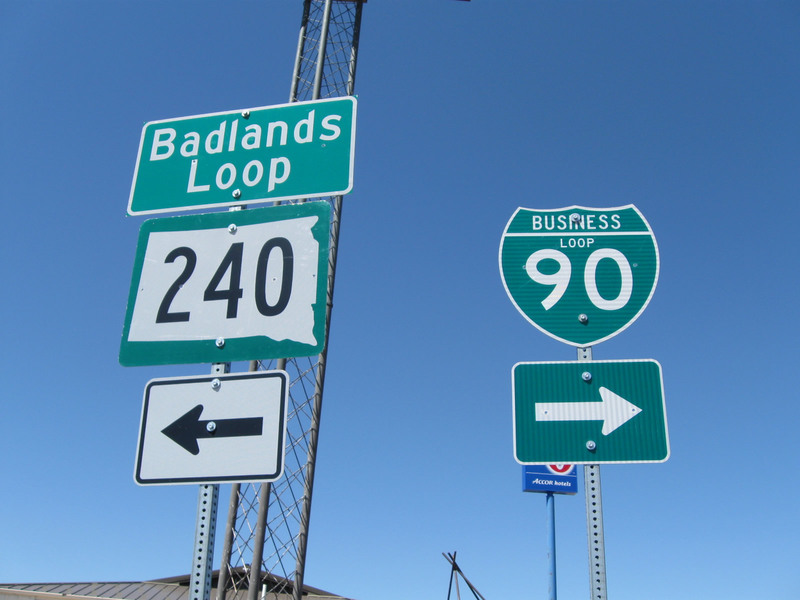 The Badlands Loop follows former Alternate U.S. 16 south and east to I-90 at Cactus Flat. The Wall business loop angles northwest from Glenn Street nearby to intersect Main Street, three blocks south of the famous Wall Drug. Photo taken 08/13/10. 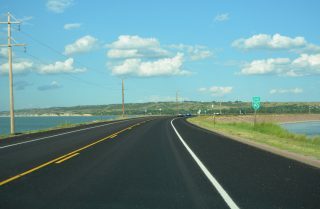 Causeways carry a portion of both Interstate 90 and Business Loop I-90 across Lake Francis Case of the Missouri River between Oacoma and Chamberlain, South Dakota. Bridges span the eastern third of the lake, which was formed in 1953. Photo taken 08/12/16. Business Loop I-90 splits with SD 37 north for Havens Avenue east across Mitchell, South Dakota. Photo taken by Jeff Morrison (06/26/06). 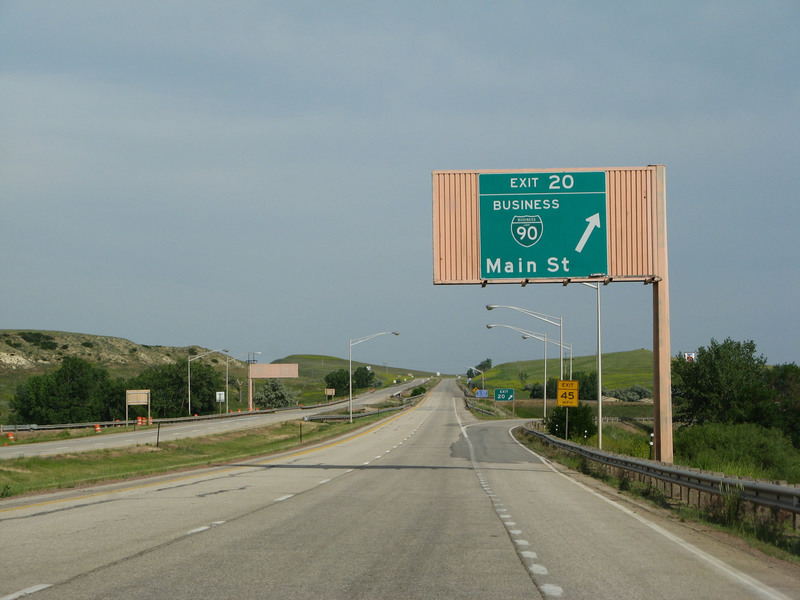 This assembly for Business Spur I-90 & SD 115 south was located on Cliff Avenue southbound by St. Michaels Cemetery. The business route was relocated from Cliff Avenue south of Benson Road, and North Drive west to Minnesota Avenue in the early 2000s. The change took place when Cliff Avenue was widened and realigned south of 34th Street North. Photo taken by Ed Wilson (08/00).